37% of Americans stated that they trusted the abilities of CTU agent Jack Bauer to step in and intervene before the terrorists were able to carry out their actions. 14% of those surveyed stated they believed that whilst the terrorists would be successful, the Enterprise would then come back in time to prevent it from happening. Most surprisingly, however, were the remaining 7% who said they thought all the terrorist attacks in the last 5 years were just a new cable show on Fox. 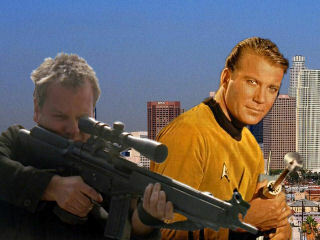 5% of Americans surveyed said that if Kirk and Bauer worked together, no evil could prove unstoppable. When commenting on the results of the poll, Hankman stated there were many holes in the public's logic. He explained, first of all, that the Star Trek fans who had faith in Captain Kirk were misguided. �This is even more ridiculous... Jack Bauer is a fictional character from the TV series 24. He won't come barging in to save the day... where was he on September 11th? On vacation? No, that's your fictional TV series... not the terrorist attacks going on around the world. 2f3 is my hosting provider. I have been very pleased with the service provided so have put a link here.